Aside from other things, Heroes of Might and Magic played a significant part in my life. This is my and this site's Heroes autobiography. In 1995, in far away Siberia, I've began playing Heroes 1. This game captivated me and we often played it with a friend in hot seat mode. There was a little shed at our staircase, which the two of us cleaned out of various pieces of wood and rubbish and made our headquarters. We used to make crossbows, which could actually stick an arrow into wood from 15m away with some accuracy. From this, we began calling ourselves orcs, as in HOMM, and called our HQ "stick hut", which is the dwelling of the orcs. Using a vivid, I drew a mage tower inside the door of the "stick hut", which soon had electricity, a fold out bench and a work table for producing arrows, discussing tactics or whatever else. I imagine telling that boy that it wouldn't be long before he would be on another side of the planet, running an international internet community of Heroes players. He wouldn't believe me. One evening of 1997 I was riding my bicycle home in Auckland, New Zealand where we recently immigrated. I was heavily bruised and 10km away from home, but I was happy. Earlier that day my friend and I had a bicycle collision. I received proper medical treatment, but that wasn't the reason for my happiness at all. Hanging off the handlebars of my bicycle was a plastic bag containing two brand new boxes with computer games - C&C: Red Alert and Heroes of Might and Magic 2: The Succession Wars! I loved Heroes 2 and we played a lot of hot seat games with the same friend who I had a bike collision with. Soon I started making creature stats tables for my own reference, as DOS .txt files. Soon I began exploring the internet, looked up a web page making tutorial and made a page with notepad, Valera's COOL Page, which was mainly cool due to its name and a few animated GIFs. Valera's COOL HOMM2 Page followed and imagine my joy when it got 12 visitors in one day! The page was very colourful, had a few maps and a bit of writing. Gradually I added other sections and due to a twist of fate it was frequented by about 150 people each day. I was obsessed. I remember declining my friend's invitations because I wanted to update my page, and how sad that made him. Using the amount of visitors and advertising, I was able to get paid web hosting without paying for it. After the release of Heroes 3, I've renamed the site into Age of Heroes and added more sections. Age of Heroes gave birth to Heroes Community which was an amazing success (see below). Due to the university work, personal problems and lack of interest in playing HOMM, Age of Heroes froze and wasn't updated for a few years. Part of the reason was the overwhelming amount of maps being submitted. After few years of putting off escalating amounts of work, I gave up. Midway through the university I've envisioned a website which was a mixture of a community forum and an information website. HOMM4 was coming soon. Age of Heroes United would be a resource that would contain volumes of game information and be closely linked to current tournaments. I've obtained permissions from the two big HOMM3 sites that were dying at the time (The Nether Gods and Celestial Heavens Unleashed) to use their information for the new project. It was all looking good - I've had the layout, navigation and gallery scripts ready, but the amount of work overwhelmed me. Most of the game information wasn't done, and it seemed impossible that I would ever do it. The project stalled for about a year before I had the guts to admit that I'm not going to finish it. I barely was putting enough time into maintaining the Heroes Community. Old Age of Heroes was hopelessly out of date and had some broken features. I decided that HC was all that I'm going to handle. Some time later I've tidied up AOH, and left it up for the good completed sections that it had (partial HOMM2 and HOMM3 info and complete info on POL and AB expansions). Click Here to see how Age of Heroes looked. I've founded Heroes Community in partnership with Tournament of Honor, using everyone.net's free messageboard services. There weren't many posts made on those boards (less than 10 per day), and the abusers couldn't be controlled successfully with the available mod tools. Members were leaving and Vesuvius expressed his concern that TOH can't stay with the messageboard that does not have the resources to be kept orderly. I've had a look around the internet, and found BlazeBoard, a free PHP script upon which HC as you know it is based. Vesuvius and TOH team loved it, and so did the visitors. The amount of posts simply skyrocketed to well over a hundred per day. I've added the Mod Squad, Quality Points, Avatar List, Floodprotect and many other features to meet the requirements and to amplify the fun. Everyone loved the unique messageboard system, it's simple style and community atmosphere. Champions of Tymeria tournament was a great partner of HC while it lasted, and even after the site was closed Pluvious (webmaster of Tymeria) remained a moderator and gave birth to the Library of Enlightenment forum. Pluvious has mysteriously disappeared in the late 2001 and hasn't come back since. Celestial Heavens Unleashed, resurrected by Angelspit joined the new Heroes Community, until the early 2002 when Angelspit decided to start his own heroes forum and withdrew from both partnership and moderatorship. Dungeons Keeper was another partner site that is no longer maintained. RMS, it's administrator was a long-time moderator at HC, but later started his own messageboard, Guardian's Grove and after some time resigned from HC moderatorship. MapHaven is a relatively recent HC partner site, ran by Dragonsister. Partnership with the Tournament of Honor remained strong over all these years. In 2005 DG Associates, producer of Heroes 4 Collectible Card and Tile Game selected Heroes Community to be the official messageboard for their game. I remember driving along an Auckland motorway and asking myself - are Heroes websites a part of my life that I want to keep? Why spend half-hearted effort? I was seriously that close to quitting in the beginning of 2005. No interest in HOMM, nor in my websites about it. But later into the year something changed. At about the same time Jonathan from DG Associates contacted me, I've decided, for no apparent reason other than fulfilling another childhood dream, to complete Age of Heroes. I've spent hundreds of hours working on the new Age of Heroes, starting from the HC Menu - backbone of the whole project. Heroes 1 info was made with Steven Lieberman's help few years earlier. Heroes 2 info was converted from older AOH. Heroes 3 was the biggest piece of work - over 130 pages of information! Most of it was from the old AOH and The Nether Gods - the once great HOMM3 site that closed down and gave me permission to use their pages when I was working on AOHU. I wish to express thanks to Lich for inspiration. It's hard to spend hundreds of hours working on a grand project without telling anyone! Lich also agreed to share the Heroes 4 game data and images he was putting together for the Guardian's Grove site. When Heroes 3 section was mostly done, I invited The_Hydra into the project. He was very impressed by what he saw and accepted Heroes 5 content admin position with delight. His enthusiasm and good work were a great motivation for me also. Jonathan from DG Associates provided materials for exclusive coverage of their Heroes 4 card game, and became the first advertiser of the Age of Heroes Advertising Network. Then the times got rough again. Lich was overburdened with studies and only part of the Heroes 4 info was completed so far. Heroes 4 section seemed like a huge task, and I was getting demoralised once again. But good news came. I've informed Vesuvius (TOH administrator) about the project, and he gave thumbs up to integrate Tournament of Honor and Age of Heroes web sites. The_Hydra had completed the Heroes 5 section, and after a bit of polishing it looked to be the best Heroes 5 section I've seen on the Internet! The_Hydra told me about his upcoming school holidays, and we said "right, we're gonna do this in 3 weeks" and went at it full-throttle. We've done the rest of the work in four weeks, at a rate of dozens of pages per week. Finally the hundreds of hours of hard work were completed, and it was time to unveil the secret. On 25th of October 2005, the new Age of Heroes has began. The next six months were a crucial build-up for the big future. 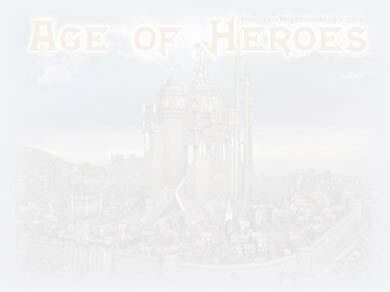 Age of Heroes was placed back on the map of HOMM web but was not yet widely known for what it had to offer. ThE_HyDrA continued his great work on keeping the HOMM5 section up to date, while both of us kept the main page alive with latest news. I've continued working on HC and created the Heroes Community Messenger, Heroes Community Search and many other forum improvements. Age of Heroes was moved to a new server which improved site performance tremendously - we even got visitors' praise for being the fastest web site they visit. Heroes Community reached 200,000 posts before the end of 2005 (if deleted posts were counted, this number would be well over 300,000). Just before the new year, Nival announced the "Create a Race in Heroes 5 Contest", which was only open to Russian participants. In order to let everyone have a go at creating a Heroes 5 Town, on 4th Jan 2006 I've announced the Age of Heroes International Create a Town Contest (AOH ICTC) which would be conducted at Heroes Community. All entries were posted openly on Heroes Community, participants helped each other with ideas, the word spread around the web and everyone was having a good time coming up with great ideas. Regardless of Nival's later announcement to accept entries in English, AOH ICTC ended up with a jawdropping 60 or so entries, many of which were pages and pages long. DGA stepped in to sponsor the contest and along with card game prizes to top 3 winners offered to enshrine the winner as a hero card in Heroes 5 Card and Tile game, which we were proud to be the first on the web to announce! I remember the hours and days spent in front of the screen with tired eyes judging the ICTC entries, behind schedule. We did not expect that ICTC would be such a success, so ThE_HyDrA and I had to judge half of the entries each and it still took a long time. The top winners were selected based on a mix of participant and judge ratings and received their prizes. Nival declared their winners in the end of April 06 - three Russian entries of extremely poor quality (Russians were outraged at the results as well). In this way our contest had even more purpose than we intended - the AOH ICTC participants keep many good memories of the contest and no one disputed the AOH ICTC winners. Towards the end of January 06 it was clear that the state of current development of HOMM5, judging from the open beta, was not up to standard to release the game in just over a month. We started a petition at Heroes Community, to demand an extension to the game's release date, for the sake of a quality game that would keep us playing for years to come, not another underdeveloped disaster like HOMM4 which nearly killed the HOMM series. Several other petitions quickly appeared around the web and then the webmasters of all major HOMM sites coordinated a centralised petition - SaveHeroes.Org. Three days later 1500 signatures were obtained. Given the lack of official attention, we proceeded with severe tactics - the News Supression Pact - which involved taking all HOMM5 content offline and posting no more website updates before the release of HOMM5 was officially delayed. It was clear that if HOMM5 was released underdeveloped, it would mean death to HOMM series and we wouldn't have a good game to write websites about anyway, so pretty much every active HOMM website signed the pact. Less than two days later, with 2500 signatures reached, Ubisoft announced that the release will be delayed! Everyone celebrated, the game was saved. 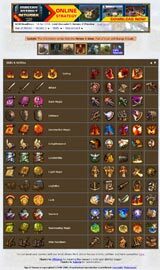 In the end of January Sfidanza joined the Age of Heroes team and brought an excellent interactive skills list based on Heroes 5 open beta. Over the next three months Sfidanza made an enormous contribution to AOH, which included an improved navigation system and dozens of Heroes 5 data tables of unmatched detail and quality. When Sfidanza's work was combined with ThE_HyDrA's, the Heroes 5 section of AOH was taken to a whole new level. Soon there wasn't a HOMM forum on the web where someone hasn't posted a link to one of these great pages. Game data pages were completed weeks before the game release, based on the Heroes 5 demo, and AOH was the only place to have all of this information. The daily traffic has grown from hundreds to thousands of unique visitors. Age of Heroes Advertising Network was succeeding and moved to it's own server in May 2006, renamed into Game Advertising Online, and began selling quality game advertising on other publishers' websites. We were weeks away from the HOMM5 release, Age of Heroes was resurrected and taking its rightful place, Tournament of Honor was about to have a big re-opening, HC was active with HOMM5 discussion, and we were ready for the golden age.